Fairwater is great for inter-generational family holidays. There is plenty of space for shared activities and yet privacy too. There are 4 large bedrooms; 3 upstairs, 2 of them ensuite, 1 downstairs also ensuite. The main bedroom opens onto a veranda with a view of the park and the sea. There are loads of cupboards and comfortable new beds. The fully equipped kitchen allows for relaxed family meals and easy entertaining. The garage takes 2 cars. The cottage was first built in 1890 and is made of sandstone on the ground floor. It's original and authentic and has a quirky charm. It is not the Ritz and doesn't pretend to be, but if you're charmed by unique, historic cottages, furnished with some Cape and French antiques, Fairwater will capture your heart. .
My husband and I completely renovated this cottage in 2015. We were living in it while we built our new house which is adjacent to it. The work we did on the cottage was informed by our experience of living in it - we knew what needed to be done to make it not only look good but work well too. This was our fifth renovation and its definitely our last! We now live next door and will be there to welcome you and introduce you to our exceptional little village. This is a really lovely place to stay. The home is very comfortable and spacious, and fully equipped with everything you might need, including firewood for chilly nights. The location is fantastic- restaurants and shops and waterfront a short 3 minute walk. And a park for the kids to play right across the street! Host is great, very professional---really good communication, made sure we were all sorted and everything in order. Absolutely recommend staying here. Thank you so much for your fantastic review. I'm really pleased the cottage was all you hoped it would be. That park is always a winner! Please come back again soon. Impeccable! Beautiful! Home away from home! Comfortable! Clean! Lovely! It was a gem of Cape Town! Clean, comfortable , beautiful and cozy! It truly was a home away from home. Very helpful and friendly! Lovely for families! Watched Whales! Beautiful sunrises! Close to lovely restaurants and awesome shopping! Overall a great experience and our favorite house to rent! Thanks so much Dean for your wonderfully enthusiastic review. We are so pleased that you enjoyed your stay at Whalehaven in beautiful Kalkbay. Fairwater provided a wonderful environment for our reunion of old friends. 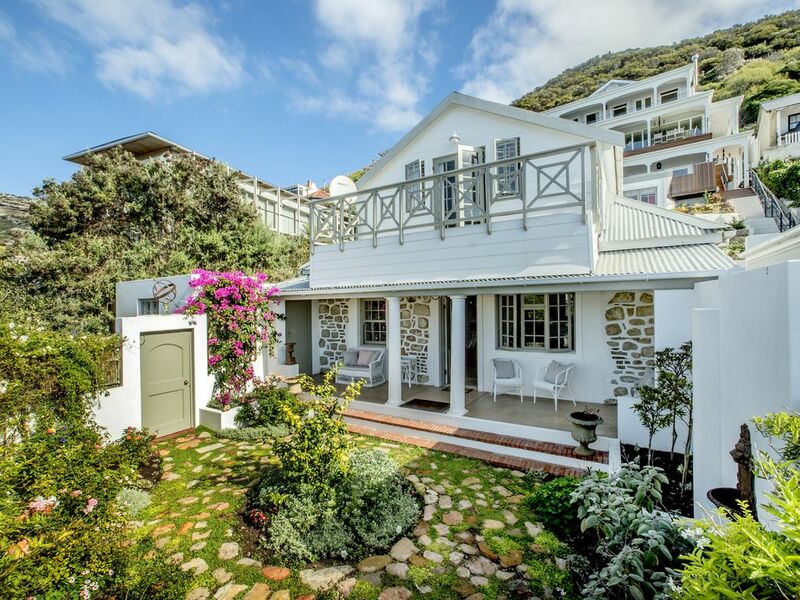 It is beautifully located -- just a short walk from the heart of Kalk Bay and a trail up the mountain -- and extremely homey. We appreciated the tasteful, (truly!) comfortable furnishings, which afforded leisurely meals and extended chats around the fireplace. The layout is conducive to everyone having a bit of their own space. I really loved how quiet the house was -- I never knew who was up til I went downstairs! I will relish the memories of delicious cappucinos in the rose garden! Highly recommend this place! Thanks so much Erin for your wonderful review. I'm just so glad you enjoyed it. It was great hosting you and your friends. Please come again! Geweldige lokatie en een fijn huis om te verblijven. De woning is erg gezellig en comfortabel ingericht en is geschikt voor 8 personen. klein nadeel is dat er slechts 3 badkamers zijn waardoor 1 echtpaar een badkamer van een ander moet delen die allemaal op de kamer zijn. Dit vraag wat afstemming. Verder is dit huis een absolute aanrader op een geweldige lokatie. Kalkbay is gezellig heeft genoeg restaurants voor ontbijt, lunch en diner met als absolute topper Harbour House. We komen hier zeker terug met dank aan Louise Parr! From Cape Town International Airport…..
Drive round the parking area on your right. Follow the road round to the left onto the Airport Approach Rd, passing the BP garage on your left hand side. Keep to the right side on Airport Approach Rd. The road leads onto a bridge that feeds onto Settlers Way/N2 highway. Merge onto Settlers Way/N2 in the direction of Cape Town. After about 5 kilometers you will drive past an old, red brick power station on your right. Keep going on the N2 for about another 5 kilometers. Then take Exit 6 for Rhodes Drive onto the M3, in the direction of Muizenberg. From here, the road changes its name but remains the M3 highway. You need to stay on this road for about 16 kilometers. You will pass the University of Cape Town on your right. For the next couple of kilometers the road is flat and there are no houses on your right, only on your left. Once you start to go downhill, you will pass the first set of traffic lights. Continue downhill on the same road keeping on the right. Pass the second set of traffic lights. Stay on the right side of the road. Go uphill and pass the third set of traffic lights. Continuing uphill, you will pass another 2 sets of traffic lights, the last set is at the top of the hill. After the last set of traffic lights, you will go under a pedestrian bridge over the highway. Continue on the M3 which is now an open highway for the last 10 kilometers to the T junction. At the T junction, turn right onto the M42 but stay on the left side of the road. Drive for less than a kilometer and you'll see a set of traffic lights a little way ahead of you. Just before a set of traffic lights, turn left onto Westlake Drive. At the roundabout, take the 1st exit onto Westlake Ave.
At the T junction, turn right onto Boyes Drive. Keep going on this road for about 5 kilometers. You will shortly see the sea on your left. You have reached Kalk Bay once the road turns sharply left to drop down to the Main Road. The sea will be directly ahead of you. At the T junction opposite the harbor at the traffic light, turn left on to Main Road and after less than a kilometer turn left again into Belmont Road. Drive to the top of the road and turn right. Our dark blue gate and garage door are on your left above the road, opposite the children’s park that is on your right. Fairwater is 3A Upper Quarterdeck Road. Our name is on the wall. Please park in front of the single garage!